Smoke is the third leg of barbecue, with the other two being heat and time. Smoke is the ancient and time-honored way to add flavor to anything you can cook. In ancient times, smoke was used to preserve meat for long periods of time. Nowadays we use it to enhance the flavor of meats by adding wood to the fire. Of course, not just any wood. Good smoke is produced by a variety of woods—hardwoods—that are low in resin and high in flavor. While you don't have to use prepackaged wood chips to add a little smoke to your fire, you do want to make sure that what you're using is all wood—no glues, nails, or chewing gum. And more than this you need to pick the right wood for the job. Different woods leave different flavors. But before we take a closer look, there's one more thing to wrap up. Do you burn the wood or not? When using gas grills it's best to put presoaked wood chips in a smoker box or wrap them in a piece of aluminum foil with a lot of holes in it. This keeps your grill from filling up with ash and clogging the burners. But get that wood close to the heat. You need the heat to smolder the wood and this means a pretty high heat. 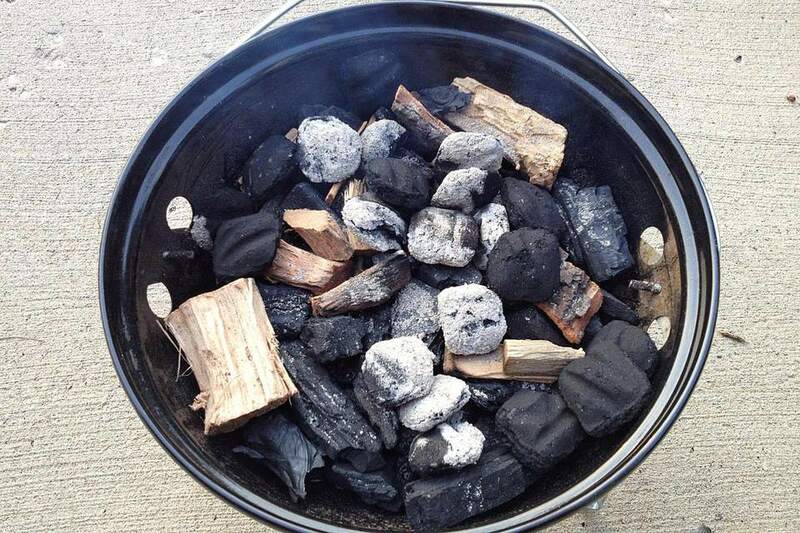 If you are using a charcoal grill or smoker then you can either put the wood directly on the coals (once they've heated up) or place them in a box. Experiment a little and find out what works best for you. Generally speaking, any wood that is hard and free of resin (or sap) is good for making smoke. If the tree makes fruit or nuts you enjoy eating then the wood is typically good for smoking. Some wood, of course, makes better smoke than others. Woods like Apple have a mellow flavor and won't give you much in a short amount of time but if you’re cooking for a while then it has time to add that mellow flavor without overpowering the food. Woods like mesquite are very strong and while it gives you a good flavor quickly that flavor will become bitter fast so don't use too much or for too long. If you haven't used wood before, start small. Use a 1/4 cup of presoaked chips on your grill and see what it does for you. One of the great things about barbecue is the wide variety of experimentation available to the backyard cook. Wood smoke is what gives outdoor cooking its outdoor flavor. A great way to experiment with wood is actually on the grill. Instead of risking that 20-hour brisket with a wood you've never tried before, try putting that wood to test on your grill next time you cook up some steaks or chops. Make sure you catch the scent of that wood. If the smoke is bitter and noxious you probably shouldn't be cooking with it. Alder has a light flavor that works well with fish and poultry. Indigenous to the northwestern United States, it is the traditional wood for smoking Salmon. Apple is very mild in flavor and gives food a sweetness. This is good with poultry and pork. Apple will discolor chicken skin (turns in dark brown). Birch has a similar flavor to maple. This wood is good with pork and poultry. Cherry has a sweet, mild flavor that goes great with virtually everything. This is one of the most popular woods for smoking. Chokecherry has a bitter flavor and should only be used in small amounts for short periods of time. Citrus woods like lemon or orange have a moderate smoke that gives a light fruity flavor that is milder than apple or cherry. Crabapple is very similar to apple wood and can be used interchangeably. Fruit, like apple, apricot or cherry, fruit wood gives off a sweet, mild flavor that is good with poultry or ham. Grapevines make a lot of tart smoke and gives a fruity but sometimes heavy flavor. Use it sparingly with poultry or lamb. Hickory adds a strong flavor to meats, so be careful not to use to excessively. It’s good with beef and lamb. Maple, like fruit wood, gives a sweet flavor that is excellent with poultry and ham. Mesquite has been very popular of late and is good for grilling, but since it burns hot and fast, it's not recommended for long barbecues. Mesquite is probably the strongest flavored wood; hence its popularity with restaurant grills that cook meat for a very short time. Oak is strong but not overpowering and is a very good wood for beef or lamb. Oak is probably the most versatile of the hardwoods. Pecan burns cool and provides a delicate flavor. It’s a much subtler version of hickory. Persimmon like the other fruit woods, mild and slightly sweet. You can also find other wood products around made from wine and whiskey barrels that impart a very unique flavor.